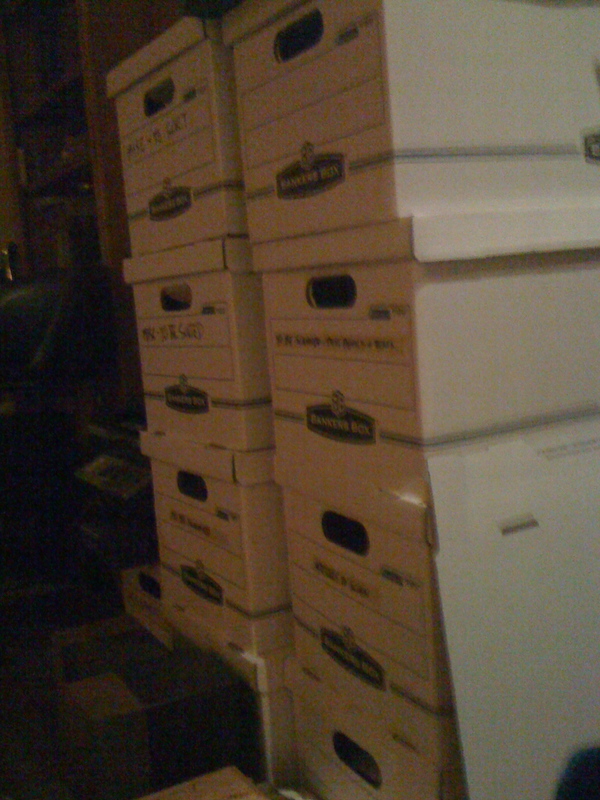 A stack of banker's boxes, which represent the remnants of my former paper library. I was inspired by a recent post from SETI’s Dr. Seth Shostak to say something about my own three-year battle against three-dimensionality. As a scientist, I’ve (intentionally) tended to collect reference papers and books into a sort of personal technical library. (I’m not alone here, as Dr. Shostak will attest.) My library includes excerpts, articles, and papers of note that I return to from time to time to support projects, refresh understanding, or simply that I saved because of the rarity and/or intrinsic value of the material. This runs headlong against the reality of finite volume and cohabitation. So, in the interests of reducing clutter at home, I began to digitally scan in every hardcopy paper and sheet of notes I’d been keeping in binders for the last ten years, fighting in vain to find versions that had already been digitized before committing myself to hours by the scanner. Having said that – is it worth it? Absolutely. I had no idea just how much time is saved during research or the writing of a paper or article when everything is digitally search-able. Precious minutes spent scanning bookshelves and thumbing through sheets of paper has been replaced by a couple of mouse clicks and finger strokes across a trackpad. It’s also turned me from a conventional paranoid data-backup-er into a completely unhinged data-hoarding zealot. Because I’ve committed myself to my digital library by shredding my original documents after scanning them in, (much like Cortez burning his ships upon reaching America to motivate his crew,) I currently maintain quadruple-redundancy with the digital library… and I might compulsively expand that soon. But, there’s good news here, too – that even for a data fiend like myself, having multiple redundant data storage systems takes up about as much space on a bookshelf as two full-sized dictionaries. That sounds impossible as I read that out-loud to myself, but it’s a modern reality. Cheap data storage has completely overtaken the data “cost” of traditional text-based information. So, while I lament the thrill of the paper, fire up the shredder and join the 21st Century, my fellow scientists and information-hounds! Your husbands and wives will thank you.